In our commitment to help you get flawless and younger-looking skin, we’ve come up with this list of the best scar removal creams out of more than 20 top performing brands today. They were selected based on their ability to reduce scar appearance, facilitate repair and the additional skin benefits they after 18 hours of hard work and reviewing. Promising results in just 14 days, Mederma PM Intensive Overnight Scar Cream has dimethicones, antioxidants and peptides to help your skin be at its best condition. It has a light consistency that works really well for new scars. Evanesce Advanced Scar and Blemish Treatment can work on almost all types of scars- acne, surgical and even stretch marks. It utilizes the power of natural plant extracts along with specific vitamins to help make your skin look more flawless and clearer. For a paraben-free option to scar removal, choose DermaSafe Stretch Mark Cream & Scar Removal Therapy. It has an organic aloe base and ingredients that are deemed safe even for pregnant women. For surgical scars, Kelo-Cote Advanced Formula Scar Gel is a must-try product. Apart from decreasing the appearance of your scars, it can also alleviate itching and pain. If you’re looking for a solution for your old scars, we recommend Selevax Intensive Scar Cream. Although a bit expensive, it can deliver results in as early as 3 weeks, depending on how severe your scars are. What Makes The Best Scar Removal Cream? Getting rid of scars is easy- that is if you have the money to undergo expensive treatments and procedures. But, if you are like most people who don’t have the money to splurge on those things, it can be challenging. You have to find the best over-the-counter scar treatment if you really want to get rid of those annoying marks on your skin. This requires a lot of patience, time and money. Now, you’re probably wondering: How do I choose the best treatment then? Reversing scars can’t happen overnight. If a product sounds too good to be true, it’s best to let it go. A good scar cream should be able to increase your skin’s collagen production in sync with your skin's normal cellular turnover rate. It should be able to reduce itching and pain, if there are any. It should contain natural ingredients. It’s also good if you can find a cream that’s enriched with the essential vitamins and minerals to revive and maintain your skin’s health and integrity. Apart from those things, you also have to pay close attention to what your creams contain. The following are considered to be generally effective and safe to use on scars. This ingredient helps reduce the formation of scar tissues. It contains a lot of antioxidants which promotes healthy skin. It works best on newly formed and minor scars. However, it may have a limited effect when it comes keloid, deeply pitted and hypertrophic scars. If you are struggling with indented scars, using a product with AHA can help you. This ingredient can stimulate the growth of skin under those scars. Good examples of AHAs include lactic acid and citric acid. Silicone-based scar removal cream works best on keloid scars. It’s believed to promote better collagen production to make those scars a lot less visible. Let’s dig deeper into our top choices for the best scar removal cream. Tired of the long wait just to see results? I know the feeling. It’s actually very common. You see, one of the things that discourage a lot of people from using scar removal creams to solve their issues is the long waiting time. Most scar removal creams can take months to visibly reduce scars. Mederma PM Intensive Overnight Scar Cream is different from those creams which is why it aced this review. Based on its own analysis, a once-nightly application was clinically proven to bring visible results in just 14 nights. Now, it’s not all good news. Although it can deliver quick results, older scars may require a longer time to fade. Another thing you’ll like about the product is its formula. The cream’s main ingredient is dimethicone which is greatly known for its healing abilities. It has Tripeptol, a formula that utilizes peptides, collagen and antioxidants. Together, those three ingredients work to prevent free radical damage. Free radicals, in case you are wondering, can cause premature skin aging and serious health conditions, like cancer. The cream also contains alcohol. If you have really sensitive skin, this might not be the product for you as alcohol can be highly irritating. The product is both sold in jars and tubes. However, as exposure to air and light can greatly decrease the effectiveness of antioxidants, I suggest you buy one that comes in a tube packaging. Apart from preserving the product, that packaging can also make dispensing a whole lot easier and less messy for you. Getting rid of old scars can be tricky. Since they are harder to remove, a lot of people tend to go overboard in using harsh scar removal creams just to get rid of them. The problem? Harsh ingredients make matters worse. They can cause more damage, making the scars darker, more noticeable and harder to remove. The good news is that there are creams that don’t rely on strong chemicals just to get the job done. Just consider Evanesce Advanced Scar and Blemish Treatment. It is packed with natural extracts, like kelp, aloe vera and white curcumin to remove both old and new scars. It can also work on stretch marks, too. The product also has vitamin B3 and collagen to boost your skin and make it look plumper. With the combination of its ingredients, the cream is effective in replacing old and dull skin cells with healthier ones. Now, I have to warn you. The cream has a brownish color which can be off-putting to some. Another issue you might encounter with this cream is its consistency. It tends to be clumpy which can make application a bit of an issue, particularly if you’ll be wearing makeup on top of it. To get the best results, be sure to use the cream twice a day and don’t forget to wear your sunscreen if you’re heading out. UV rays can make your scars look more pigmented, especially with constant exposure. If you still haven’t invested in one yet, we have a list of sunscreens you might want to check out. Like most people, the reason you’re probably afraid of applying creams is that they are sticky, goopy and greasy. Just the idea of wearing them can be enough to make you cringe. Not all creams can make you feel that way. 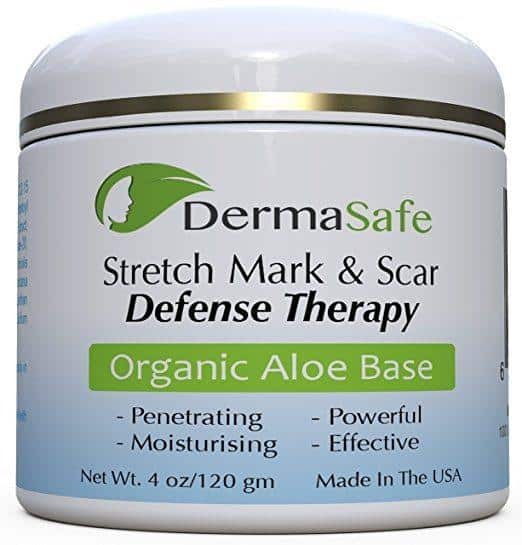 DermaSafe Stretch Mark Cream & Scar Removal Therapy, for example, has a non-greasy formulation so you won’t feel guilty of using it. It has an organic aloe base, cucumber and Wood Mallow to boost your skin's moisture. These ingredients also aid in your skin’s natural repair process, helping scars heal and fade away. Surprisingly, this product doesn’t only work with scars; it can also soothe stretch marks. To get the most out of the product, it’s recommended that you use it twice a day. Make sure to massage it into your skin until it gets fully absorbed. The cream comes with a subtle scent. It’s not really that bothersome as it wears off as soon as the product is absorbed. Ever noticed how your scars get itchy? That’s actually a part of your wound’s healing process. During your wound’s inflammatory process of healing, certain chemicals are released and those trigger itch. Another possible factor that can cause itching is the proliferation stage where skin cells bridge over the wound. While itching is normal for most scars and wounds, they can cause more problems if not soothed right away. You see, when you scratch an existing wound or scar, it creates more damage and that makes your scar worse. Kelo-Cote Advanced Formula Scar Gel is a product that is formulated to alleviate the itch that comes with scarring. And while it soothes, it can also help diminish the appearance of your scars. It contains 100% silicone to get all those things done. Now, if you are wondering how effective this product is, this scar gel is actually used by people who underwent surgery, like cleft lip, breast augmentation and other procedures. Although effective, the cream may not deliver quick results, particularly if you’ll be using it on old scars. You may have to use it longer and more frequently (twice a day) to get the results you are looking for. Apparently, antioxidants aren’t only great for aging skin. They also have properties to address scars. Selevax Intensive Scar Cream is one great example. It contains vitamin E that can help boost blood flow to your scar tissues. It also has Rosehip Seed oil, Sunflower oil and shea butter. The cream has dimethicone and glycerin, too. These two ingredients work to soften and moisturize the skin to make your scars a lot less noticeable. Surprisingly, you can also find vitamin C in its ingredient list. This is one of the most powerful vitamins you can use on your skin. It is known to help minimize hyperpigmentation of the skin and it works really when in treating acne scars. If you are wondering about the effects, that will depend on how severe your scars are. But, it can typically show results in 3 weeks which coincides with the skin’s normal turnover rate of 27 days. The product works well on both old and new scars. However, if you’ll be using it on a scar you acquired years ago, don’t expect to see results right away. When Is The Right Time To Start Using Scar Removal Creams? A lot of people readily use these creams without getting a clearer idea of what to expect. So, in the end, they get disappointed. Once a scar is already established, it can be quite difficult to repair the damage. This means that a scar removal cream can take a longer time to work. And before it does, its user has probably thrown her hands in the air already. So, as much as possible, try to use a scar removal cream once there’s a new formation of skin. Make sure that the wound has properly healed to avoid further irritation. Now, as to how frequent you should apply the product, that will depend on the type of cream you’re using. Make it a habit to read instructions, particularly if it’s a prescription cream. In general, however, you need to apply your cream twice a day to see results. Do it in the morning and before you get to bed. If you have acne scars are on your face, you need to wash your face and apply your moisturizer first. You don’t necessarily have to spend a huge chunk of cash just to get rid of those embarrassing marks on your skin. The trick is in finding a good scar treatment that can actually work. And that’s exactly what we were aiming for when we created this guide. After testing out tons of products, we were able to narrow down the list of the best scar removal cream. And among those we tested, we found Mederma PM Intensive Overnight Scar Cream as the most effective. It is formulated not only to reduce scars but also to protect the skin against free radical damage. Just make sure that you don’t have extra sensitive skin and you won’t have issues with this product.